Beyond our sea dikes many dike relicts, such as ‘sleeperdikes’ or secondary dikes can be found in the landscape. These dikes often have neither a water-retaining function nor a monumental status and are therefore largely under threat. But what if one of these threats can serve as a catalyst in preserving these ancient old relicts in our landscape. Bloemendaal, G. Instromingskaart van Goeree-Overflakkee. In Gebroken Dijken: Goeree-Overflakkee en de ramp van 1 februari 1943. Middelharnis: Flakkeesche Drukkerij J.& M. Boomsma, 1954. Accessed on 3-12-2018. On a cold winter day a group of Heritage students toured the island of Goeree-Overflakkee. Goeree-Overflakkee was chosen as the case study area for the course Politics of International Heritage in which climate change and sustainability was studied in relation to heritage. Probably Goeree-Overflakkee’s oldest heritage is the dikes. The island has a long tradition of embanking. Dikes were often constructed in a particular pattern, which is largely still visible today. When in 1953 the sea dikes breached during a major flood, many secondary dikes prevented the water from pouring in to villages such as Dirksland, Melissant and other parts of the Netherlands. The construction of the Dutch Delta Works and the renovation, elevation and strengthening of the sea dikes left many secondary dikes without their water-retaining function. However, these dikes were inseparably part of the Dutch ‘fight against the water’ and therefore important cultural-historical objects in our landscape. Many former dikes were already constructed centuries ago and are in fact former sea dikes, which later were replaced by new stronger and higher sea dikes. Nowadays, these former dikes are under greater pressure than before. Due to the construction of new roads, new space for recreation, work and housing, and the increasing scale of agriculture, dikes are often excavated and thereby erased from our landscape. Currently, governments are working towards a better regulation of these important cultural-historical objects in our landscape to prevent them from being excavated. Another threat to former dikes is climate change. Due to the increasing sea level, many old dikes are currently inventoried if they can still perform their water-retaining duty, whereas many have been neglected over the past years. In the beginning of this century, more research was carried out about the future-proofness of our water-system. Remarkably, a commission presided over by Pier Vellinga, professor in climate change, advised to give the former dikes their water-retaining function back. This idea was backed by water boards and the Dutch provinces. The dike breach in Wilinis in 2003 was also an important catalyst in this process. Currently, ancient dikes are more relevant than ever. The water board Hollandse Delta has given some former dikes their water-retaining function back and has thereby made these ancient dikes part of the water-system once again. 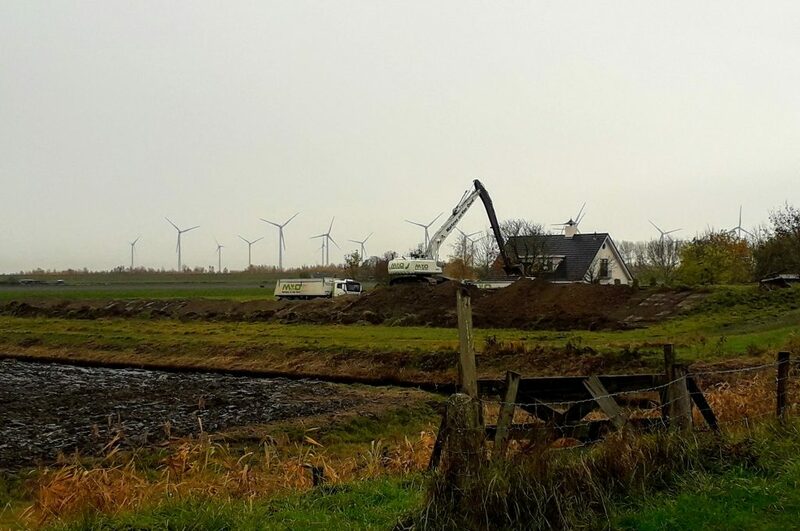 Although some claim that the reinforcement of the former dikes is at the expense of the cultural historical value, there are enough possibilities in which the cultural-historical is taken into account during the process. By giving former dikes their water-retaining function back, the dikes form an important solution to future threats such as the rising sea level. This proofs once again that the past can serve as a source of inspiration when solving future problems.